I think everyone has a particular vegetable that they always end up cooking the same way. I simply couldn’t have another plate of steamed or stir fried chard so I put my thinking cap on and realised maybe chard isn’t the only vegetable I haven’t paid much attention to. Whenever I have leeks around they normally end up in a slow cooked pork stew; namely because I don’t really like leeks and I can’t taste them as much this way. Courgettes are another example (and I’m sure the bane of many vegetable gardeners’ lives) and they almost always end up as fritters. To avoid characterless chard this simple open lasagne is perfect. Start by cutting the bacon into small strips and put into a frying pan with a little oil. Get the bacon frying while you prepare the chard. Strip the chard leaves away from the stalks and put in to two separate piles. Slice the chard stalks to roughly the same size as the bacon and shred the leaves. When the bacon is turning golden brown add the chard stalks to the pan and fry for a few minutes until the stalks have softened. Crush in the garlic and then add the chard leaves. Fry for another minute or so until the leaves have started to wilt and then add the crème fraîche, plenty of pepper and a little salt. Keep cooking this, stirring occasionally, until you have a thick sauce. While the sauce thickens get a pan of salted water on to boil. Cut the lasagne sheets in to squares (you should get four squares from each) so you end up with twelve squares. When the water is boiling add the squares of lasagne and cook for around three minutes or according to the packet. You want to add the lasagne in single layers so that they don’t stick together so you might need to do it in batches. Remove and keep warm when cooked. Mash the basil in a pestle and mortar until it’s almost a paste then add some salt and pepper and drizzle in some olive oil until it’s about 50:50 basil to oil. To assemble the dish put a square of lasagne on a plate then spoon the chard mix on top layering up and alternating between lasagne and chard. Finish by sprinkling over the Parmesan and basil oil. This is such a quick dinner to make but I think it looks like it takes an age. It is so full of flavour and different textures it’s a great way to use the chard. I’m sure this would work in a more traditional lasagne format but I like the openness of this pasta dish as I’ve never made anything like it before. Crème fraîche works particularly well with this as cream would be too heavy and the fragrant basil oil rounds it all off nicely. If only I could think of something like this for that pesky swede that has been hanging round at the back of the fridge. Re the swede – why not make a Cornish pasty? 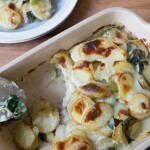 Or slice it thinly and cook it in a gratin with some potatoes and/or celeriac? I even love mashed boiled swede as long as it has loads of pepper on it. That looks gorgeous! There are loads of great ways to cook Swiss chard if you own any of Ottolenghi’s books – he does great things with it, particularly an amazing split wheat, pomegranate molasses and chard stew in Jerusalem. But you’re right about always cooking some things the same way – I’m the same. 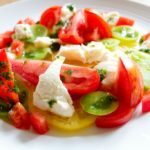 Lovely recipe, really keen to try it! Loving this – it’s so wonderfully plated. Really creative and inspired recipe Caroline – a little touch of genious with the basil oil. Using chard in lasagna sounds unusual for me 🙂 But lasagna is such thing that you can combine things and get a delicious result! That looks delicious! I love chard and I like to treat it like water spinach, stir-fried with a spicy sambal sauce consist of chilli, garlic and the pungent shrimp paste. YUM! Nice, I think which veg that chard is after looking at the pictures. The outcome is good, adore the creamy touch and wonderful flavors. I LOVE open lasagne. This looks so incredible. I think if I took out the meat, it would still be amazing. Very nice way to enjoy chard! I only recently discovered chard when I realized it grows very well in the North Florida garden. Now, I am always looking for ways to enjoy it. Thanks for sharing. Beautiful presentation Caroline….I had open lasagna before in restaurants but never thought in making it at home…thanks for the recipe. Well now, I was just wondering what to do with all the remaining chard in my garden and this dish looks like a perfect way to use it! I have pancetta, too, so what great timing this is. Thank you! One of the things I love best about food blogging is seeing what other people make. It helps me get out of my rut so much! Great idea with the chard. 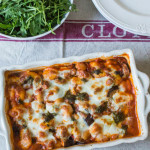 Chard in lasagne…I adore the healthy idea and it looks absolutely delicious. characterless chard! say it ain’t so! i actually don’t eat a lot of the stuff, but i’m not sure i’ve seen it used in such an appetizing way–great dish! what a brilliant way to use chard! it really is a gorgeous dish, and sounds insanely delicious! WOW..this lasagna looks positively dreamy! The way you plated it is the way lasagna is usually plated at 5-star restaurants..and this lasagna definitely belongs in a 5-star restaurant! I can almost taste the smoked bacon, chard and basil oil as I type this. Amazing creation, Caroline! This is such a beautiful dish. What a great way to change things up with your favorite ingredient. 🙂 I say these are way better than just stir fry or steam chard! I get a glut of courgettes every year but I’ve never made a fritter, although I relate to what you’re saying. It’s funny how we sometimes pick a single use for things that are actually really versatile.